At the start of the 2016-17 baseball season for the Quinnipiac Bobcats, the team welcomed eight new freshmen. One of those freshman is Evan Vulgamore. 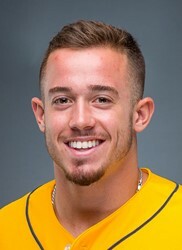 The 5-foot-10-inch, 190 pound athlete has played a total of three positions for the Bobcats to start the year in right field, second base and his natural position of catcher. Vulgamore came in as a highly-touted recruit after batting .646 with five home runs during his senior season at Bow High School in his hometown of Bow, New Hampshire. He was also named First-Team All-State all four years he was in high school, which is quite the accomplishment. Vulgamore was a member of the Concord Cannons for his summer and fall teams and this is where most players are able to get recognized for playing baseball at the college level. Perfect Game Baseball ranked him as the fourth best catcher in the state of New Hampshire and the 368th best catcher in the nation, both for the class of 2016. Vulgamore said he knew he could play baseball at the division one level his freshman year of high school. “I realized I could compete with older guys and after seeing some of the schools they were going to, I felt that I could be at a little bit of a higher level than them. I think my knowledge for the game was really something that helped me get to the next level,” Vulgamore said. During his junior and senior years, Vulgamore received interest from a total of nine college programs including Quinnipiac. Of those schools, all of them play at the Division I level. Vulgamore said he chose to come to Quinnipiac because of the coaching staff. “As soon as I came on campus they made it seem like home,” Vulgamore said. On top of this, he was still able to commit to a Division I program despite having Tommy John Surgery, which for position players is roughly a 14-month recovery. Vulgamore said the recovery process was grueling. “There are still days where my arm doesn’t feel 100%. I am finally able to play again after not playing in a competitive game for two years, which is great,” Vulgamore said. One of the great attributes to Vulgamore off the field is his dedication in the classroom. He graduated from high school with a 3.8 grade point average and says his performance in the classroom is due to his desire to play college baseball. At Quinnipiac, he is a business major and currently has a 3.48 grade point average. This success has continued for Vulgamore and he is proud of where he is both academically and athletically at this point during his first season as a Bobcat. On the field through 20 games, Vulgamore has started 12 games and appeared in 15. After coming into the year expected to be used mostly for his bat, Vulgamore has established himself as an everyday starter to end the month of March. He is batting .163 and has a slugging percentage of .286. His on base percentage is .226 and he has three doubles, a home run and five runs batted in over those 15 appearances so far for the Bobcats. When asked about his first collegiate home run, Vulgamore described the moment as special. He has been a solid option in the field as well, posting a .940 fielding percentage. Vulgamore feels he is best at catcher but is willing to do whatever the team needs in order to win games. So far this season, Quinnipiac has played every game on the road. They opened the season in San Antonio, Texas and have most recently returned from West Long Branch, New Jersey. Vulgamore said the travel has been awesome. “Honestly, I did expect to receive some playing time even as a freshman, but the road games gave me a nice opportunity to see where I stand and help contribute,” Vulgamore said. The Bobcats currently sit 7-13 but are optimistic about the remainder of the season, especially when conference play picks up more in April. Quinnipiac is currently ranked 204th in the nation and looks to get more production out of players like Vulgamore. As he moves from a small town of only 7,500 residents in New Hampshire to the heights of a division one team here in Hamden, his biggest challenge during that switch has been the mental side of the game. “Reading pitchers and their pitches as well as defensively and planning when the ball is going to be hit to you is critical at this level,” he said. Quinnipiac plays at home April 1 against Marist College. Students and fans can expect Vulgamore to be in the line up and ready to perform for the first time at home this season.